. :: Welcome To Bintan - Nikoi Island Resort Packages ::. Nikoi is a 15 hectare private island 8km off the east coast of Bintan, Indonesia. Located less than 85km from Singapore, travelling time from Tanah Merah ferry terminal is approximately two and a half hours. Long regarded as one of the most stunning islands on this relatively unspoilt coast, Nikoi is fortunate to have remained in pristine condition. It is ringed with white sandy beaches and coral reefs of spectacular colour and diversity and a coastline studded with magnificent white granite boulders that seemingly defy gravity. Rising to a height of 30m, the island also boasts a rain forest where colossal trees, including native Banyan trees, provide a sanctuary to a diverse population of local birds. 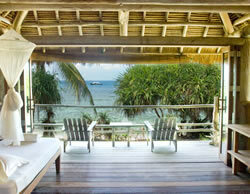 The design of the beach houses reflects both traditional Indonesian architecture and contemporary form. Using driftwood and alang alang roofing to blend into the environment, each beach house incorporates a modern ensuite bathroom. Providing “simple barefoot luxury” in a sublime setting. The beach houses utilise a unique double layered roof design to promote natural ventilation. This cooling system is enhanced by the use of overhead fans and the siting of each beach house just metres from the beach. Ocean breezes and the unique cooling effect of the land mass provide a working example of “nature’s air-con”. A spectacular pool has been built in amongst the granite boulders on the north-eastern side of the island and provides a destination within a destination. Set high above the sea it overlooks one of the prettiest beaches on Nikoi and provides uninterrupted views over the South China Sea. There is also an adjacent wading pool for young children and a bar. Activities available to guests includes serious relaxation, swimming, sailing, snorkeling, diving, massage, nature discovery and island hopping, windsurfing, standup paddle boarding, kayaking, tennis, croquet, and boule. Our one bedroom beach houses have over 100sqm of floor space. Our standard one bedroom has two bathrooms, one ensuite and one on ground level. Four of our one bedroom houses have a small bunk room downstairs suitable for two children, making them ideal for a family of 4. These beach houses only have one bathroom. • 4 persons sharing basis. • 6 persons sharing basis.